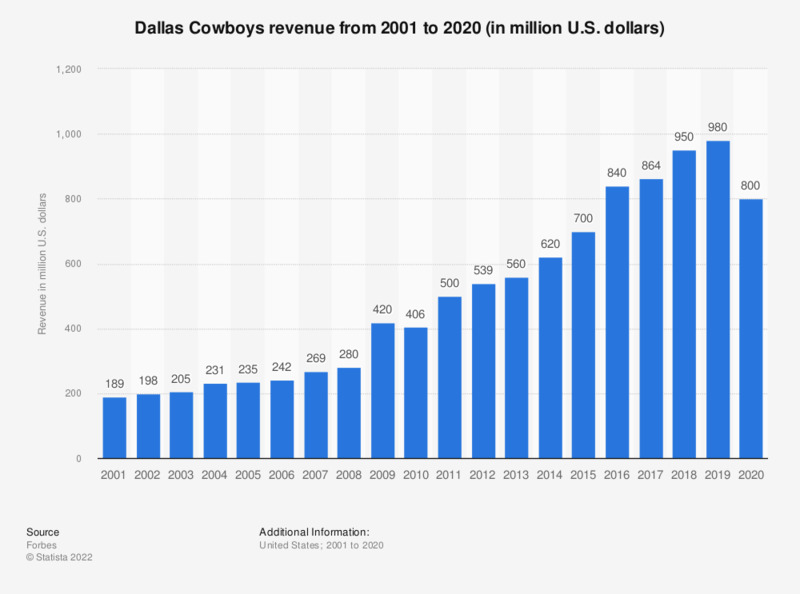 The statistic depicts the revenue of the Dallas Cowboys, franchise of the National Football League, from 2001 to 2017. In the 2017 season, the revenue of the Dallas Cowboys was 864 million U.S. dollars. The Dallas Cowboys are a professional football franchise of the National Football League (NFL). The franchise joined the league in 1960 as an expansion team and has become one of the most successful teams in the league both financially and in terms of on-field success. The team is owned by Jerry Jones, who bought the franchise for approximately 150 million U.S. dollars in 1989. In 2017, the revenue of the Dallas Cowboys franchise was at 864 million U.S. dollars, making it the highest-grossing franchise in the NFL. According to Forbes, the franchise now has an estimated total value of 5 billion U.S. dollars. The team’s home games are played at Cowboys Stadium, which opened in 2009 and has a seating capacity of 80,000. Its construction reportedly cost around 1.2 billion U.S. dollars. The Dallas Cowboys have appeared in the playoffs 30 times in franchise history, reaching the league’s championship game — the Super Bowl — ten times. Five out of ten times, the team won the Super Bowl, most recently in 1995. Notable players include quarterback Troy Aikman, running back Emmitt Smith and wide receiver Michael Irvin. All three are members of the Pro Football Hall of Fame and were members of the Dallas Cowboys teams that won three Super Bowls in the 1990s. Women: Do you seek out quizzes and polls online on parenting?